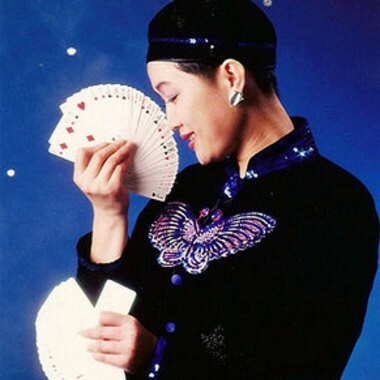 Featured in this week’s History of Magic is Chinese magicienne Juliana Chen, who is possibly one of the finest proponents of sleight of hand magic and the winner of numerous awards. Juliana was born in the Chinese province of Hunan in 1986. At age 10, she was selected to train at the Hunan Performing Arts Academy and underwent study in ballet, gymnastics foot and hand juggling. After two leg injuries she was discouraged from continuing with foot juggling and while in hospital saw a television programme by the famous Japanese magician Shimada a brilliant magician in his own right. It was Shimada’s performance that influenced Juliana to become a magician. She started a daily study and practice session with playing cards and ping pong balls, as there was little other magic available. Within four years, the ambidextrous Juliana had developed such a will to be successful that she entered The “All China Best Magician Competition” and won first place. She seemed to have a natural flair and talent for sleight of hand magic. With her desire and ambition to succeed at the international level, in 1988 Juliana applied for permission to study English in Canada and was successful. At that particular time there was little work for magicians available and it was not easy for a lady magicienne to break into the magic scene. She began work in furniture sales to support her studies. A little later she started her own graphics business. She began to meet with Canadian magicians and was introduced to the Vancouver Magic Circle in 1990, the largest magical society in Canada. Her strong association with fellow magicians encouraged her to enter the International Brotherhood of Magicians annual convention and was awarded the “Stage Magician of the Year”, in Salt Lake City. This very prestigious award persuaded her to sell her graphics business to allow her to concentrate on her career as a magician full time. Already audiences were beginning to see that Juliana had exceptional skill at manipulation (sleight of hand) particularly with playing cards. Skill in manipulation takes many years to perfect and already she was quite accomplished in all aspects of sleight of hand. A good lesson she teaches is that it takes real dedication to get where she had. Long hours of practice and commitment to her chosen art. Over the next four years she began to win numerous magic awards and competitions in Europe. Then in 1997 she won the prestigious Grand Prix at the “World Congress of Magicians” (F I S M) in Dresden Germany. This is regarded as the “Olympics in Magic”, and the event has been held every three years since 1948. Winning Gold at the World Championships of Magic is the highest distinction for any magician and often leads to fame and fortune. Juliana became the first woman, and the only magician of Chinese heritage to win gold with her solo act in the 50 year history of the World Congress of Magic. She became the ‘First Lady of Magic’ and delights audiences wherever she appears on stage. Television show, an NBC Special. Just a year later Canada’s leading current affairs T.V. programme, broadcast a profile of Juliana calling her the ‘Hottest magician around’. She then appeared on the Champions of Magic special hosted by Princes Stephanie in Monaco. When Juliana Chen appears on stage the setting is very much oriental from her costume and music and is quite dramatic. Her card productions are nothing short of spectacular with the rapid production of card fans and single cards that literally appear at her fingertips by magic. She has the uncanny skill to scale single cards right across the stage and out among the audience at tremendous speed. Her card scaling is legendary. 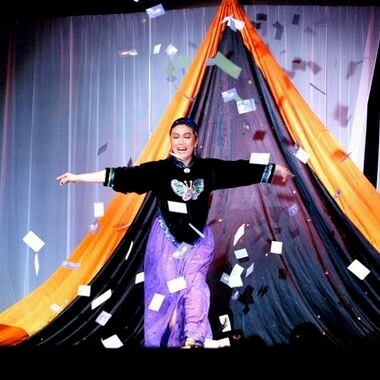 Juliana is also an accomplished Illusionist and often features her illusions on the big stages of the world. She makes use of different masks during a dance routine that is pure theatre. Almost at the blink of an eye the face masks change dramatically. One particular illusion features her entering a smallish box that has poles passed through it then the box is squashed up against one end the doors opened showing she has vanished, only to appear on the other side of the stage. Her illusions are very carefully choreographed and rehearse d that shows how much work goes into their staging. In the autumn of 2002 Julianna moved to Las Vegas taking her career to the next upper level. Shortly afterwards she was awarded the Chavez Memorial Trophy in recognition for her Professional Excellence by the Chavez Committee of the Society of American Magicians Hall of Fame and Museum in Hollywood. In 2003 she was nominated for Stage Magician of the Year by the Academy of Magical Arts in Hollywood’s Magic Castle and continued to receive extraordinary publicity and write ups in top magazines. Her career has blossomed with award after award and playing many variety theatres around the world. If young aspiring lady magicians needed motivation, the clear lesson could very well come from Juliana Chen. One of her most important successes, which will never be forgotten in the history of magic, has been opening the doors of China to the West for cross-country exchange of magicians. She also managed to persuade the executives of the Chinese Acrobatic and Magic Association to participate in Western country competitions and conventions. The International Brotherhood of Magicians was able to establish the first IBM Ring in China. (There are over 300 IBM Rings worldwide.) Thanks to Julianna Chen’s effort and commitment, China today is producing some of the finest magicians in the world of a very high standard. Another lesson taken from her career is the effort she has made in hosting and fostering good relationships between magicians that cross cultural, ethnic, and social barriers and you can do the same. You too can set your own goals and achieve them just like Juliana Chen.